33' to Alaska: Thursday, July 2, Inian Cove (By Glacier Bay entrance)…A Whale Of A Day! 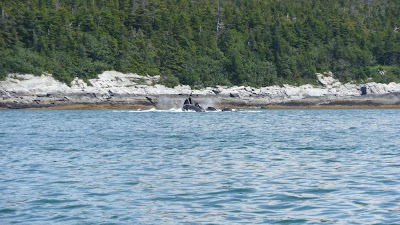 Thursday, July 2, Inian Cove (By Glacier Bay entrance)…A Whale Of A Day! I told the family that this afternoon we would see whales. Our destination was the entrance to Glacier Bay, an 87 mile run. We had smooth water for the first half of the trip, when we stopped to watch some whales. What a treat. We must have seen about 50 of them. A rare sight, we even got to see them bubble feed time after time. (Bubble feeding is when the whales go down deep, swim in a circle while they exhale corralling the little fish and then swimming up through the middle of them with their mouths wide open catching them all.) It seemed like we stopped every half an hour to watch whales. The wind was kicking up a bit so we needed to keep going. Once we got closer to Glacier Bay entrance, we stopped to do some salmon fishing. I caught a little guy but threw him back. While we were fishing, another 25 whales or so came along and fished with us. They got so close, that when they blew, we all thought someone on board farted…it was “whale halitosis!” Cody and mom estimated that they were about 30-50 feet away from us. We could hear them make their snorts and smell their bad breath! We also saw dolphins, eagles, and sea lions munching on salmon. I got some great video! 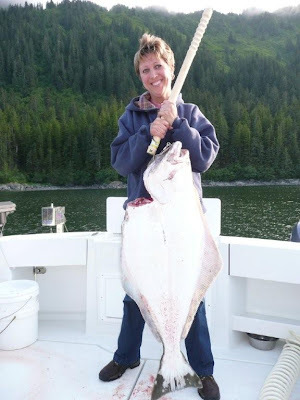 Just before we reached our anchorage, we decided to fish for some halibut. 16 minutes later, Val caught another 49 lb. halibut! Can you believe it? I knew there was a reason I took her with! (She told me to write that!) She is a fish magnet! (Although, I rig everything, help pull it up, gaff it, clean it, package it, and eat it!) We got to our anchorage about 7:30, cleaned the big fish, vacuum packaged him, made crab and steaks, and ate till we couldn’t stand it anymore. It’s still light at 10:40 and everyone is still rarin’ to go! Poker time! See ya later!